Native packaging was first introduced as a part of the JavaFX 2.2 SDK enabling you to package an application as a native bundle and then installing and running the application without any external dependencies on a system JRE or JavaFX SDK. Next it became usable for Java SE projects as well. Native packaging does not change the deployment model of your application: it takes your application as it is, packages it together with Java runtime, and produces an installer that is common for the operating system you are using. The point is to make the whole thing independent on whatever Java runtime users have or do not have on the target machine. You can take such an installer and run it on a machine where there is no trace of Java, and it will install both the application and the necessary Java runtime bits.The size of such installers is quite big, because even a "Hello world" application will carry with itself a large portion of Java runtime artifacts. In this tutorial you will create an EXE installer for a Java SE application and an MSI installer for a JavaFX application for the Windows operating system based on the sample applications bundled with the IDE. On Windows, both the applications are installed into the C:\Users\<username>\AppData\Local\ directory and are available in the Start menu. Inno Setup 5.5 (or more recent) for producing EXE installers on Windows is required. WiX 3.7 (or more recent) for producing MSI installers on Windows is required. 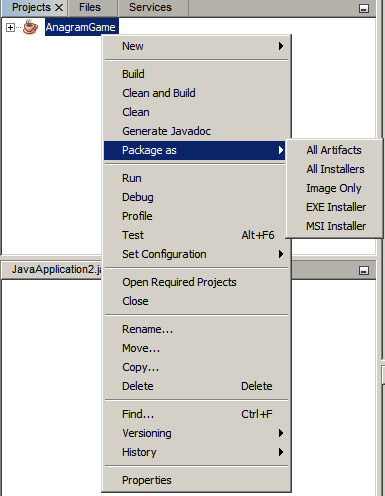 For a list of tools required for making installers for different platforms, see "Packaging an Application as a Native Installer" in Developing Applications with NetBeans IDE. Download ispack-5.5.3.exe from the Inno Setup Downloads page. Accept the Inno Setup license agreement and click Next. Follow the instructions in the install wizard for installing Inno Setup. Download wix37.exe from the WiX Toolset - Download page. Follow the instructions in the install wizard for installing WiX. On Windows 7, select Start > Computer > System Properties > Advanced system settings. In the System Variables pane, double-click the Path variable. In the Edit System Variable dialog box, add a semicolon followed by a new path to the Variable value field (for example, C:\Program Files (x86)\Inno Setup 5 or C:\Program Files (x86)\WiX Toolset v3.6\bin ). To check if the installed tool is in the Path, open the Command Prompt window and type iscc.exe for Inno Setup or candle.exe for WiX. (In case the Command Prompt closes instantly, try specifying cmd.exe /c cmd.exe /k iscc.exe or cmd.exe /c cmd.exe /k candle.exe respectively.) The following figure shows what the Command Prompt should display if Inno Setup is added to the system Path variable. Make sure the IDE is restarted after the tools are added to the system Path variable. 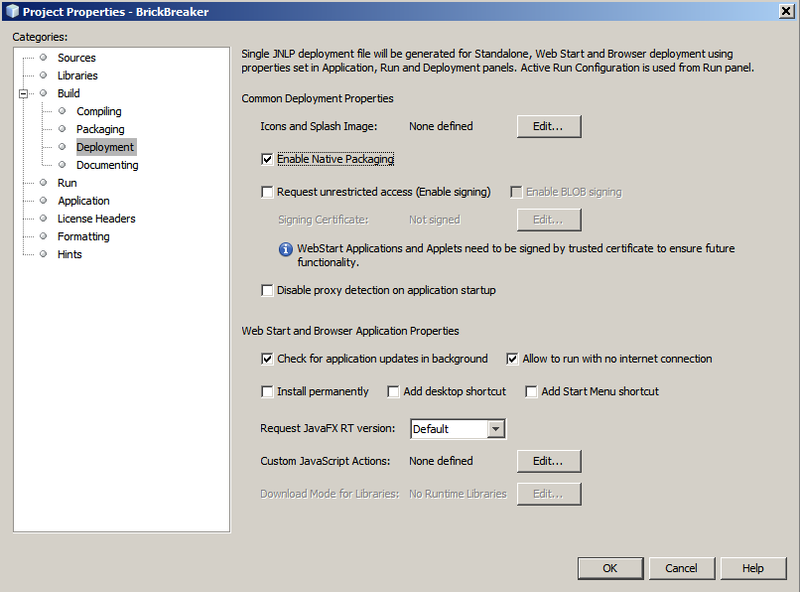 Before packaging an application in an installer an application itself needs to be created. 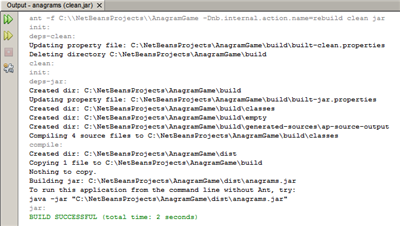 You will create a new Java SE project with the Anagram game example which is shipped with NetBeans IDE. 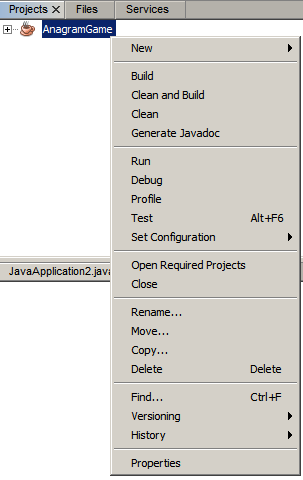 In the New Project wizard, expand the Samples category and select Java. Choose Anagram Game in the Projects list. Then click Next. In the Name and Location panel, leave the default values for the Project Name and Project Location fields. Click Finish. The IDE creates and opens the Java SE project. To test that the created project works fine, run it by choosing Run > Run Project from the main menu. 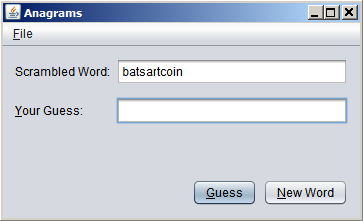 The Anagrams application should launch and display on your machine. 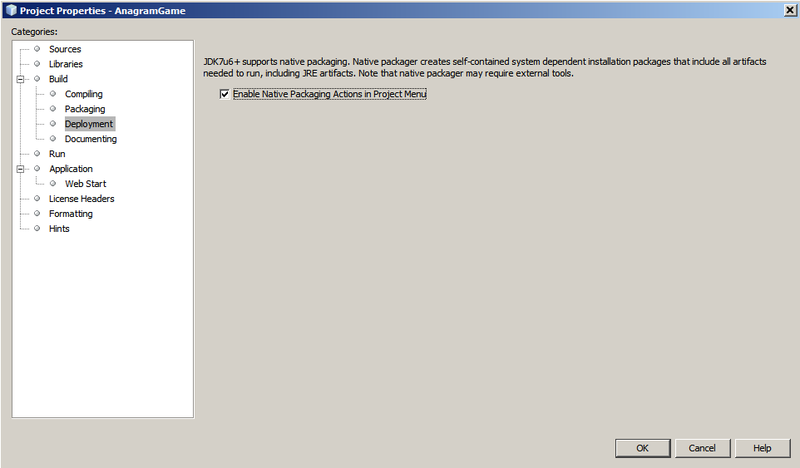 The native packaging actions are disabled in the IDE by default. 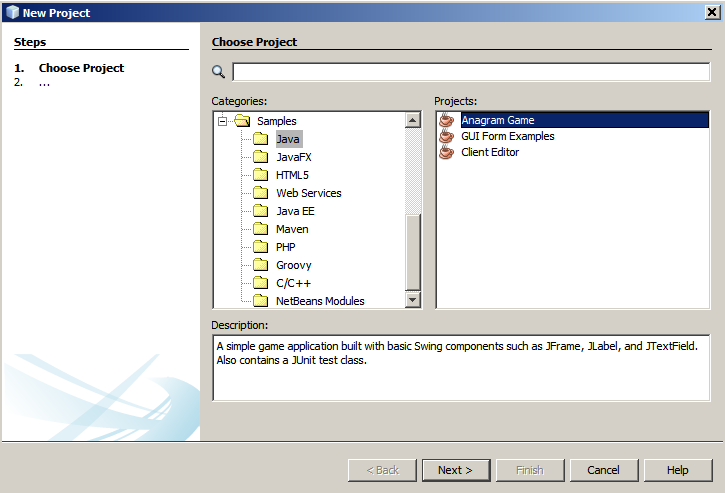 Right-click the AnagramGame project in the Projects window, to check the actions available for the created Java SE project in the IDE: there are no package related actions in the project’s context menu. 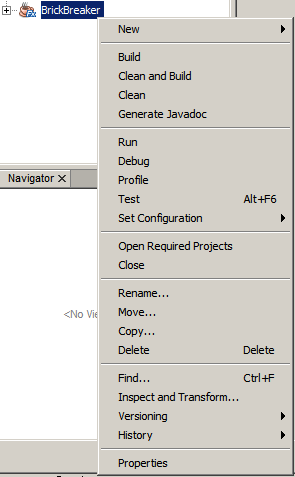 Right-click the project node in the Projects window and select Properties from the context menu. In the Project Properties dialog box, choose the Deployment category and select the Enable Native Packaging Actions in Project Menu option. Click OK. A Package as command is added to the project’s context menu. It is time to clean and build your application for deployment. Choose Run > Clean and Build Project from the main menu. The IDE displays the results in the Output window. A dist folder that contains a jar file is created in the project folder. The application can now be packaged in an installer for Windows. Right-click the AnagramGame project and choose Package as > EXE Installer from the context menu. The IDE creates an EXE installer only if Inno Setup is installed and added to the system Path variable. The IDE displays the progress and result of the packaging process in the Output window. The IDE first logs some progress and then for some time it looks as if nothing is happening - this is exactly the moment when Inno Setup is working in the background. It takes a while for the packaging to get completed. 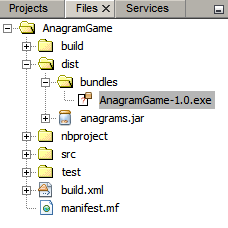 When the EXE installer is ready, it is placed in the AnagramGame/dist/bundles/ directory. You begin by creating a JavaFX project using the BrickBreaker sample project bundled with the IDE. In the New Project wizard, expand the Samples category and select JavaFX. Choose BrickBreaker in the Projects list. Then click Next. In the Name and Location panel, leave the default values for the Project Name, Project Location, and JavaFX Platform fields. Click Finish. 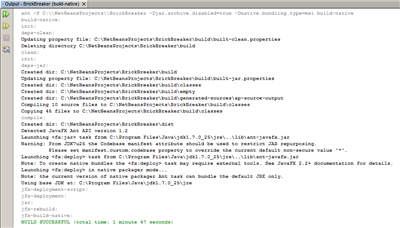 The BrickBreaker JavaFX project displays in the Projects window in the IDE. To test that the created project works fine, run it by choosing Run > Run Project(BrickBreaker) from the main menu. 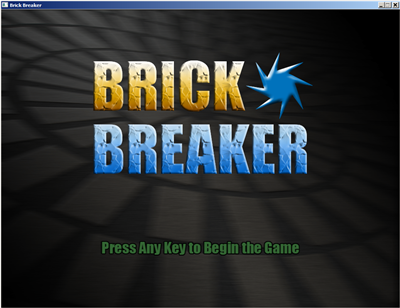 The Brick Breaker application should launch and display on your machine. To use the native packaging support in the IDE for your project, you need to enable it first. If you right-click the Brick Breaker project, you will see no native packaging related actions in it. In the Project Properties dialog box, choose Deployment in the Build category and select the Enable Native Packaging option. Click OK. 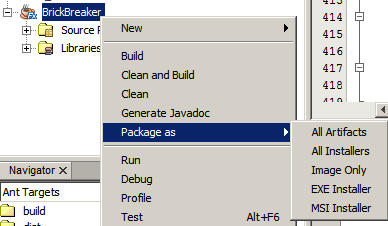 The Package as item is added to the project’s context menu. Your JavaFX application is now ready to be cleaned and built. 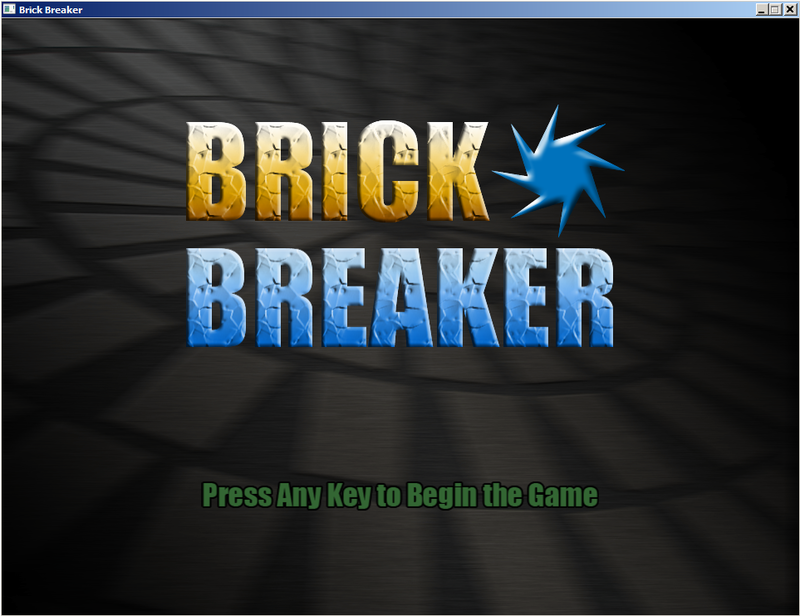 Right-click the BrickBreaker project in the Projects windows and choose Properties. 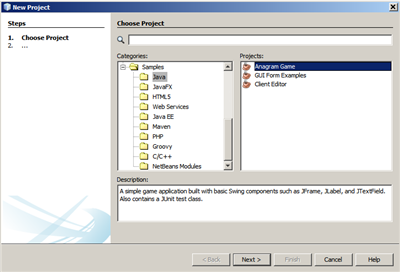 In the Project Properties dialog box, select the Sources category. Set the Source/Binary format to JDK 8 and click OK.
Right-click BrickBreaker in the Projects window and choose Clean and Build from the context menu. 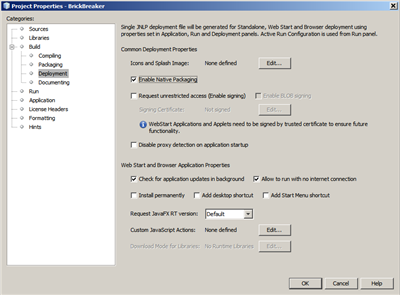 The application can now be wrapped into a Windows-specific installable package. Right-click the BrickBreaker project and choose Package as > MSI Installer from the context menu. The IDE creates an MSI installer only if WiX is installed and added to the system Path variable. The IDE first logs some progress and then for some time it looks as if nothing is happening - this is exactly the moment when WiX is working in the background. It takes a while for the packaging to get completed. 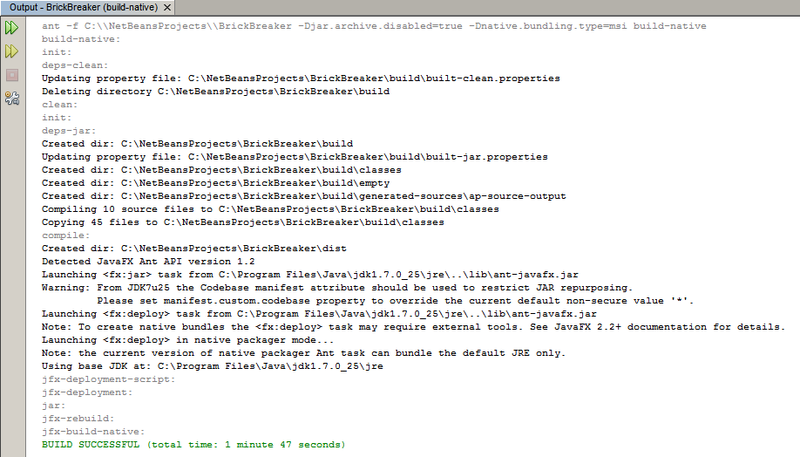 The installable JavaFX application is located in the BrickBreaker/dist/bundles/ directory. 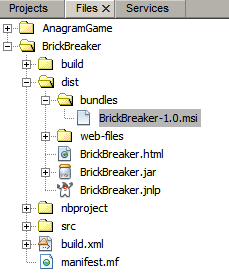 When the AnagramGame-1.0.exe and BrickBreaker-1.0.msi installers are done, you need to check which directory the Anagram and BrickBreaker applications are installed natively into. Browse to the installer file ( AnagramGame-1.0.exe or BrickBreaker-1.0.msi ) on your hard drive. Both the applications should be installed into the C:\Users\<username>\AppData\Local\ directory and be available in the Start menu.